Tracy Waterhouse leads a quiet, ordered life as a retired police detective-a life that takes a surprising turn when she encounters Kelly Cross, a habitual offender, dragging a young child through town. Both appear miserable and better off without each other-or so decides Tracy, in a snap decision that surprises herself as much as Kelly. Suddenly burdened with a small child, Tracy soon learns her parental inexperience is actually the least of her problems, as much larger ones loom for her and her young charge. Meanwhile, Jackson Brodie, the beloved detective of novels such as Case Histories, is embarking on a different sort of rescue-that of an abused dog. Dog in tow, Jackson is about to learn, along with Tracy, that no good deed goes unpunished. 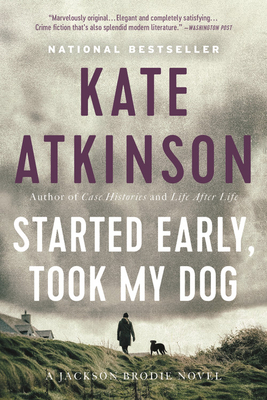 Kate Atkinson lives in Edinburgh. Her first novel, Behind the Scenes at the Museum, was named Whitbread Book of the Year in the U.K. in 1995, and was followed by Human Croquet, Emotionally Weird, Not the End of the World, Case Histories, One Good Turn, and When Will There Be Good News?.